A Berwyn Heights resident is hospitalized after sustaining burn injuries during a fire inside of her house. At about 4:45 pm, Sunday, October 30, Fire/EMS units from the Berwyn Heights and the College Park area were alerted to a house fire in the 8500 block of 58th Avenue. Berwyn Heights firefighters arrived to find fire coming from the 1-story single family home and an adult female just exiting her home. Paramedics tended to the injured adult female as firefighters worked to extinguish the fire. The adult female resident was transported by paramedics to a Burn Unit in fair condition. It appears that she was the only person at home when the fire started. There were about 35 firefighters and medics that required about 10 minutes to extinguish the fire. Fire Investigators believe the fire started in the master bedroom located in the rear of the house. The cause of the fire remains under investigation until Investigators have an opportunity to interview the resident, however, they believe the fire to be accidental. Fire loss is estimated at $80,000 for the structure and contents. Two dogs belonging to the resident were not found during searches of the house and remain unaccounted for. Firefighters noted that smoke alarms were present in the home and sounding when they arrived. Citizens and residents should ensure their smoke and carbon monoxide alarms are working and provide a fresh battery in their alarms and test alarms monthly. 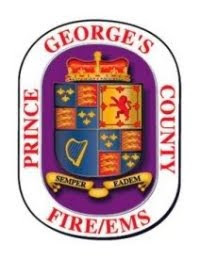 Prince George’s County residents can request a smoke alarm installed in their homes, free of charge, by contacting our Safety First smoke alarm hotline by calling 301-864-SAFE (7233).